Set up in 2007 in an exquisite Georgian building a few blocks away the bustling streets of Mayfair lay texture. One that offers European food with Scandinavian and Nordic influences, it’s fair to say that it’s a cuisine rarely seen in London. Simplicity does the trick for its interior décor, neutral and pastel colours that flourish the walls, accompanied by eye-catching modern art. The dining room brims with elegance. Not the biggest of restaurants, but size doesn’t mean everything; this place was proved popular by the abundant amount of corporate professionals with large disposable incomes. The regular tasting menu is a perfect platform to expose Sverrrison’s creativity. £79 for 6 courses. More like 8 though. This dish really took me by surprise. It’s such a curious looking dish and a very clever way to capture the diner’s attention. Served with two dips, the flaky cod skins were flavourful and crispy. Very poppadom like. Or similar to crispy seaweed. Or to a more British comparison, potato chips. Iron bark pumpkin, soup, hazelnuts. It was lukewarm, but was a great starter to the meal, cleverly warming up our taste buds before the next course. There was a hint of sweetness yet a subtle mild taste of hazelnuts that were infused into the soup. A fitting theme given the weather right now, winter vegetables! Consisted of chervil root, celeriac, pickled trompette, vegetable nage. You can taste so many different things here. Soupy – given the complementing sauce that emanated from the root vegetables, sweet but also savoury, I devoured it. 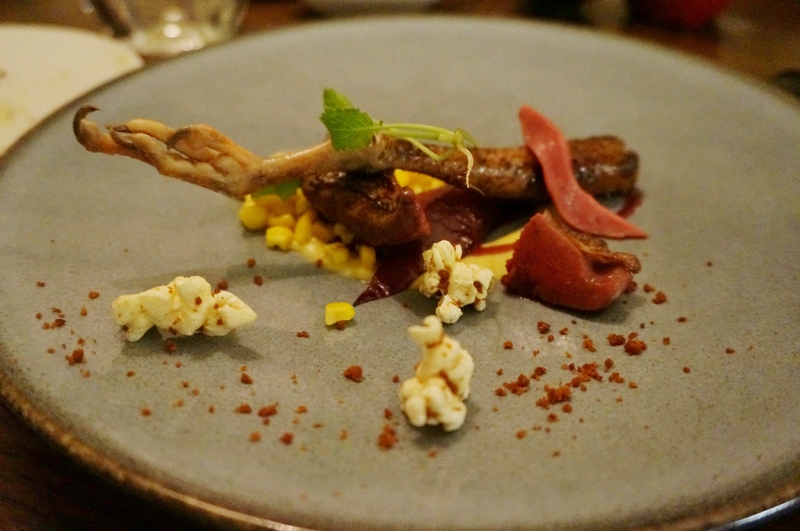 Chargrilled Anjou quail with shallot, sweetcorn puree, red wine essence and bacon popcorn. Yes, bacon popcorn!!! Tender, succulent, but the size of the portion leaves you wanting more. Another rather soupy dish, but cleverly fitted in between two meat dishes. Consisted of shellfish, fregola, pickled vegetables and herbs. The flavours are very clean-cut, lots of different aftertastes and essences, many of which I just couldn’t figure out. This is what I call precision cooking. Consists of red cabbage, brussel sprouts, bacon, chocolate sauce. Yeah, you heard right, it was exactly that combination. Venison loin, soft juicy and tender. Red cabbage and brussel sprouts made it bitter and sour. Bacon, slightly salty but subtle. Chocolate sauce, a sweet tangy flavour. There were parts that I liked and parts I didn’t. I credit the originality so far in this tasting menu, being able to cover a breadth of flavours, but at times, too many constituents, too many flavours! Sometimes simplicity is key, all you need here after 5 courses is something refreshing. Flavoured, sugary ice with Icelandic skyr (type of soft cheese that tastes like yoghurt). This cleverly refreshes your taste buds and rinses out all that you’ve eaten before. Getting you prepped and ready for the finale. I liked it so much I’ve included three photos of it. Hehe. Grace, Cheukie and I collectively adored this dish. The champion of all courses tonight. Nutty, warm sponge cake with a crispy clean topping. Rich, melty-ish chocolate stabbed with a cute breaded flake and coconut bits sprinkled all over… heaven. Different textures, different flavours, it was warm, it was cold, it was everything. A picture from every angle… my friends have such patience. Service: Not intrusive. Friendly. Attentive. They did discover that I was a blogger though, and made me feel very welcome, giving me a signed Tasting Menu too… Nevertheless, top notch service is what you expect at a Mayfair, Michelin starred restaurant.